"In Japan, the hand can be used like a knife. But this method doesn't work with a tomato." This historic proclamation signaled the very beginning of America's love affair with the Ginsu knife. And truer words were never spoken -- never. The year was 1978, and the first Ginsu television commercial -- the forerunner of what we now call "infomercials" -- aired nationwide. Not only did these remarkable examples of the cutlery art have cutting edges beyond compare (for the price, anyway), the marketing strategy behind this product's introduction was nothing short of cutting edge as well. Recently, Needtovent's esteemed President (an approval rating of 92%) attempted a hostile takeover of the Douglas Quikut Corporation, located in Walnut Ridge, Arkansas. (With Needtovent, could there be any way other than "hostile?") Unfortunately, our COO got a quick "OH NO!" from the loco yoko's in Razorback Country and the proposed business acquisition failed to cut the mustard, much less the cheese and the, well, you already know what's coming next. The news isn't all bad. 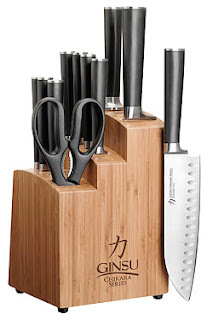 Besides receiving a gleaming new Ginsu knife set, Needtovent also was granted Quikut's permission to declare that it is truly the only website on the cutting edge of film reviewing. This endorsement from the Ginsu gurus is not only appreciated and accepted with humility, but we shall endeavor to maintain this trust by increasing the number of films reviewed prior to their formal release both here in the U. S. of A. and in the Land of the Rising Sun. Accordingly, Needtovent will strive to have more cutting edge, advanced, pre-release reviews than any of the "Rotten Tomatoes" who have the temerity to call themselves film critics. From this day on, there's no comparison -- Needtovent's cutting edge reviews rule the 'hood. After all, a Rotten Tomato doesn't stand a chance in a knife fight. Coming soon -- an in-depth review of 3 DAYS BLIND -- a delightful, independently financed ensemble comedy that is currently in the final days of post production. And remember, you will read about it here first.